Jersey boys, Oxford street shopping with Chummy + haul! Well hello to you my reader chums and a Happy Easter to you all! 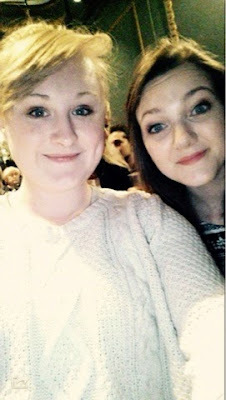 Yesterday for Danielle's birthday I treated her to tickets for the musical, Jersey Boys in London. As we were heading there in the evening for the show, we thought it'll be a good idea to take advantage and head to Oxford street beforehand. I've never been to Oxford street before because when I go to London, I usually go to Westfield or a shopping centre for a shopping trip. 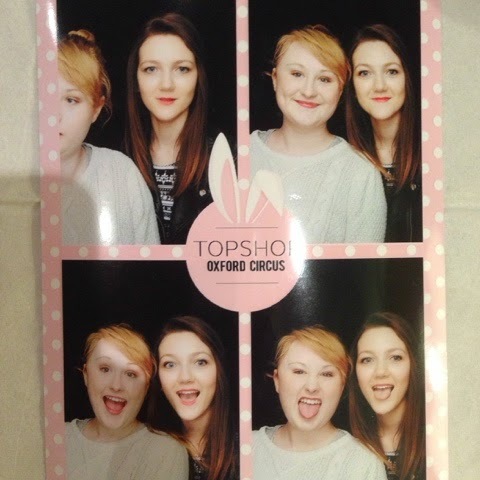 We arrived in London around lunchtime and our first stop was Topshop. I was rather taken aback by how big it was with all the snack places and counters included in one shop, it was like a mini shopping place! Whilst having a good old look, we discovered this Easter photo booth and thought it''ll be a nice memento to take home with us. As you can tell we weren't ready for the first picture, however I'm obsessed with how all the others turned out! Its super cute and a lovely thing to have. After this, we had a browse in a few other shops, picked up a couple of things and headed to the restaurant for dinner. We booked Pizza Hut in advance and underestimated how big Oxford Street was because it took forever to find! Whilst walking there, we discovered other shops I wanted to go into but sadly didn't have the time, although this was probably a good thing because it saved my bank balance! When dinner ended it was show time wahoo! The photo below is us both in the Theatre all excited for the show to begin! 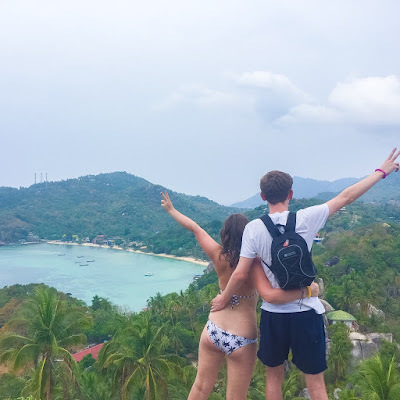 I didn't really know what to expect as I'd been hyping myself up for the two months since I booked it (Danielle didn't know at this point), however it exceeded my expectations! 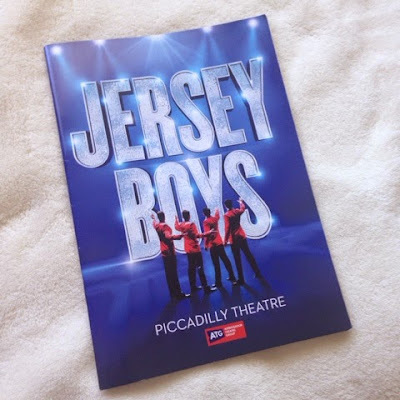 The show was bursting with singing, dancing and made me want to get up and sing along! There wasn't a dull moment throughout the whole performance and it really brought the whole story and songs to life that I'd listen to previously. We both thoroughly enjoyed it and I'm super happy Danielle loved her surprise! I would definitely recommend this show to anyone, it was phenomenal! The first item are these gorgeous shorts from Topshop. I've mentioned in a couple of my posts how I'm going on holiday with my best friends in the summer so wanted to pick up a few summery items. 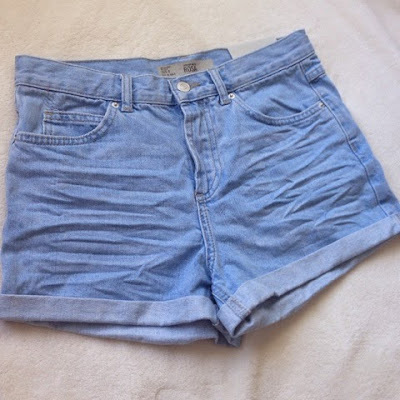 I already have a few pairs of shorts, however I loved the colour, shape and comfort of these ones. They're a different shade of blue to my other lighter pair and I like this in between colour. The shorts were £26 but you can feel the quality! I can't wait to start styling them! 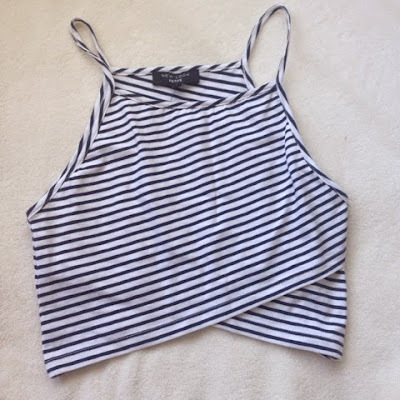 The next item is a crop top from New Look's petite range. I love this, the design is rather unique because of the layering effect it has, different to other clothing items I own. Also, stripes are one of my favourite patterns, therefore by putting a unique style and stripes together, you've got a lovely top! I think this is going to look super cute with high waisted shorts, sandals and a kimono. It was around £8- an absolute bargain! Onto all the Primark items, now I must say Oxford street's Primark was huge and overwhelming, I felt rather anxious getting pushed and shoved. Despite this, I reassured myself and did find a couple of items I liked. 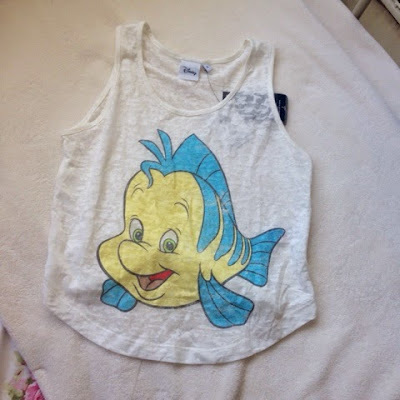 The first is a flounder top, I noticed this on the way to the tills and thought it'll be lovely to just throw on in the summer on a warm day! I'm a big Disney enthusiast so I'm pretty sure I'll get a lot of use out of it. It cost £5. Another Disney purchase was this Disney princess t-shirt. 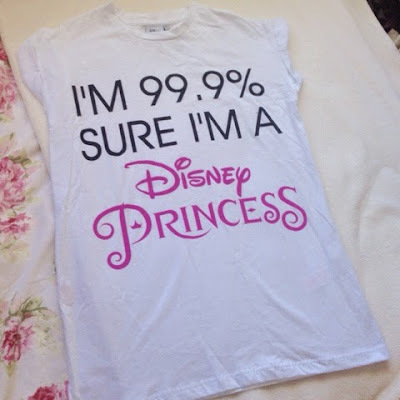 Disney princess films are my favourite and when I saw this, I just had to have it! This was only £6. 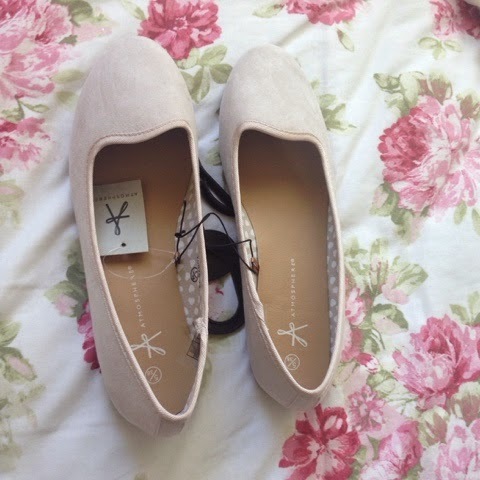 As we've transitioned into spring, I wanted to buy some more light coloured shoes I can wear casually. There was loads of different pumps in Primark and I really like the colour and shape of these. For £4 they're an absolute bargain!. 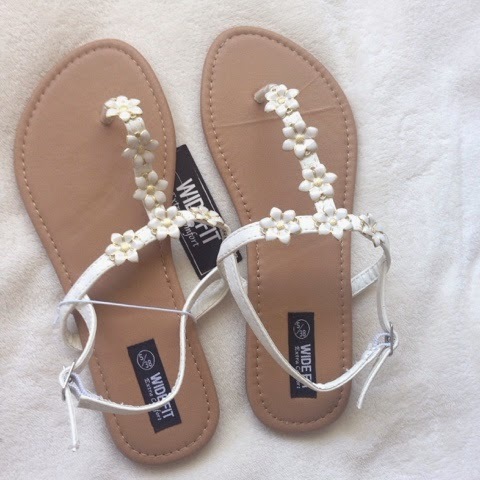 With the holiday coming up, I wanted to purchase a couple of pairs of sandals to wear on days down the beach, pool days or to wear on a meal out with a lovely summery dress. I chose a pink flower pair, which are similar to the cream pair I already own and a daisy patterned pair that are super cute! I can't wait to start pairing these with outfits. 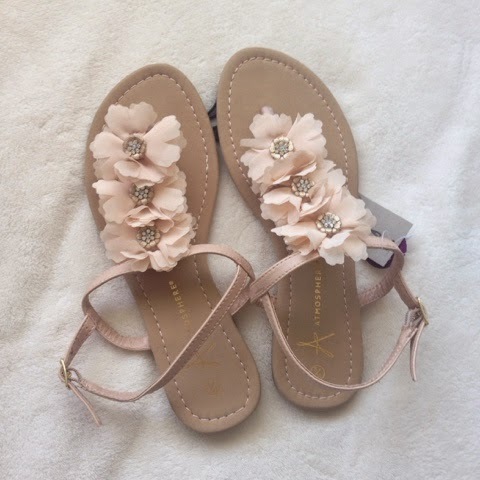 Both pairs were only £6 meaning if I lose them when I'm away its not a big chunk gone out of my pocket! 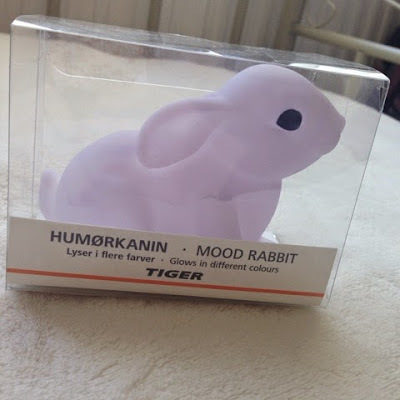 The last thing I bought was from Tiger and its this mood light in the shade of a rabbit! I thought it was really sweet and it'll look lovely in my room at night. 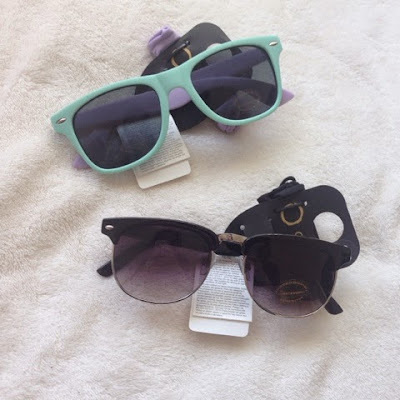 I hope you enjoyed a little insight to my day out and the items I picked up. I feel truly blessed to be able to go and treat my best friend to the theatre for her birthday and have such a lovely day out! She means an awful lot to me and even though at times in the day I was very anxious, (I talked about my anxiety in my new years resolutions post) she understands, helps reassure me and is able to make me smile! I did the same thing for my sisters birthday recently but we went to see Les Mis instead, hope you had a nice time, it looks like you got some great pieces! I love a good Primark; so visiting the store on Oxford Street is now on my bucket list!